Your room is ready at the Rock Ledge Motel! 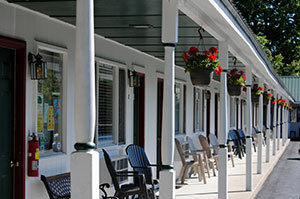 A comfortable, family retreat at Alexandria Bay, Rock Ledge Motel celebrates the classic charm of the Thousand Islands area of the St. Lawrence River. In ‘the Islands’ — a magical place where sunlight dances off the water and a scent of cedar lingers in the air — this 20-room boutique motel whispers of days when life was less complicated and more relaxed. The Thousand Islands (there are over 1,700 of them) attract a multitude of visitors every year. Many families return - generation after generation - as islanders and summer visitors alike have boated, fished and played on the River since the 1800’s. You’ll find plenty of things to do in the Islands, and when you stay at the Rock Ledge they’re all at your doorstep. Along with picturesque scenery, visitors to the Thousand Islands have traditionally enjoyed fun, friends and warm hospitality. And, at the Rock Ledge, your hosts Jim and Cindy Durand are delighted to help carry on this tradition. We’re pleased to invite you and your family to come and experience the Thousand Islands. Welcome to Rock Ledge Motel!